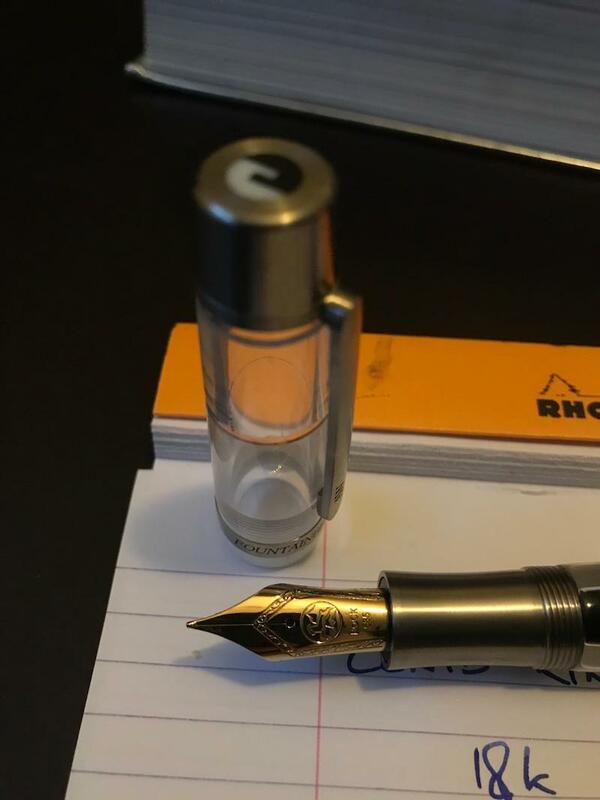 My apologies for being 'new' to the forum; I've lurked here for many years, and have digested countless reviews of pens and inks. My fountain pen journey began as a 16 year old, almost two decades ago, with a Waterman Phileas as a birthday present. Unbeknownst to me at the time, my youthful use cracked the section, and so for a long time I thought fountain pens were supposed to leak ink into the fingers. Needless to say, my passion quickly waned. Then in 2012 on an overseas trip, I impulse-bought a modern Sheaffer - which was a delight, and with a fine nib it was suddenly usable on all sorts of papers that I had thought the Waterman had not been (as a fat medium)...and I became interested in pens again. Over the past 5 years, I have acquired and disposed of a great many of the 'greats' - Lamy 2000, Parker 51, Pilot VP, Pilot 823, Sailor 1911, etc. With a brief peak at around 20 pens, it became obvious that I do not enjoy what many of you cherish in this hobby - the routine of cleaning and re-inking individual pens. It was clear to me that I needed to whittle the collection down to a small, but cherished, core. As I would go through up to 2 converters/cartridges of ink per day, I gravitate to piston/vacuum/other fillers. And so, having sold all the others, I was left with: a Sterling Silver Sailor 1911L with Naginata Togi nib for my first daughter's birth, a Burnt Orange M800 for my second daughter's birth, a Homo Sapiens BB nib, a 1953 Pelikan 400 Brown Tortoise, and a 1970's Omas Gentleman with super flexible gold nib. Which brings us to here. 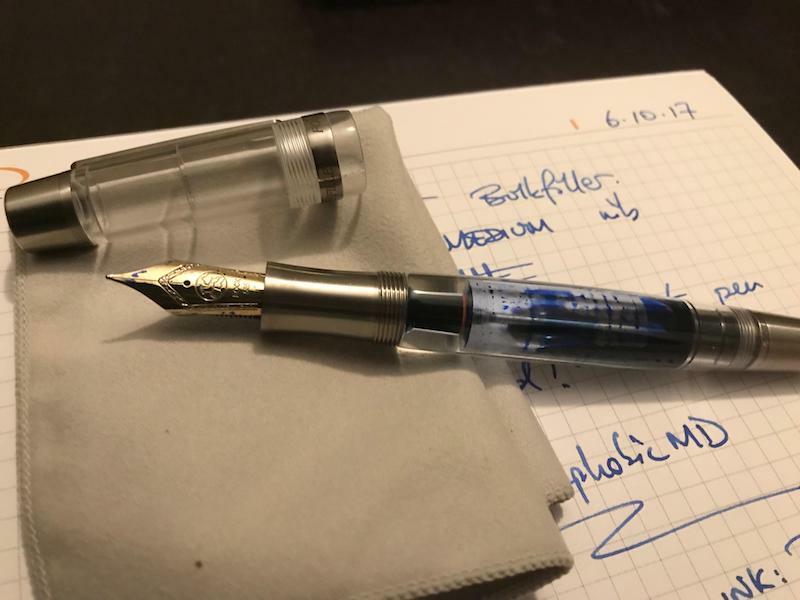 After much internal debate and consideration, I felt Conid represented most of what I loved about fountain pens - a unique mechanism, clever engineering, exclusivity, a wide selection of nibs, and the practical elements of easy cleaning and long-duration between fills of ink. Herein lies my review. I tend not to like numerical ratings, as inevitably a new purchase scores very highly and it is impossible to compare scores between pens. Apologies therefore for lots of text, and some of the pictures will have my Reddit username attached. The Conid website is clear and concise, with lovely pictures of each model and a variety of after-purchase options. I picked out the model I most liked, thought I would not be satisfied without trying one each of the gold and titanium nibs, and put a few comments in the comments section. Within a short time, I received an email relating to my order and confirming details. I was then given an estimated ship date. Almost to the day, I received notification of package and shipping. 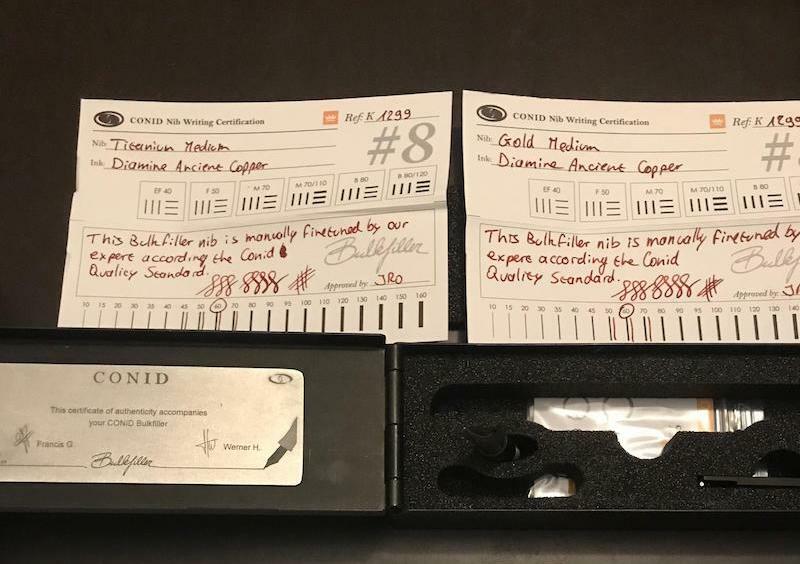 As the pen departed Conid they sent a nice update email with pictures of my particular pen and the writing samples they generate during the testing process. DHL from Belgium to Australia took 5-real-world (ie. not business) days to arrive, including customs clearance (with a small amount of duty and import tax to pay). Pretty snappy! It all looks like it's made to suit function, rather than being 'pretty', and that's exactly how I like it. I've read other reviews say they'd prefer even simpler packaging to reduce cost - I think it suits the pen nicely, but that's just me. I've had TWSBIs previously, so they are my immediate comparison point. I haven't previously had a high-end demonstrator, so users of M800 demonstrators may be able to chime in. At this price point, I like my pens to feel solid and I prefer a bit of weight. I have big hands. This pen fits me better than any other I've used and feels valuable. For comparison, I feel modern 149s feel plasticky for their price point (but this is very much personal taste), and I overall don't like the light plastic feel in a high-end pen. The finish is perfect on my pen. I cannot find any imperfections that bother me. Everything is 'necessary', down to the beautifully functional clip that's machined from a solid piece of titanium. To summarise, even if nothing else, the feel of the pen out of the box made it clear the money spent was used wisely. As far as I'm concerned, this is what it's all about. Like many of you, I've had fluctuating experiences with the big manufacturers tending to provide nibs that write with...ahem...varying quality from the box (cough cough Visconti). The effort Conid put into checking nibs prior to shipping is evident. I ordered both an 18k Gold Medium and Medium titanium. They are both superb. I ordered both because prior reviews didn't help me pick one over the other. On the one hand, I love gold nibs and value smoothness with a hint of character. For example, I'm not the hugest fan of Sailor's "pencil on paper" feedback, even though I have retained a lovely example of their pens. But oldrifleman's review that they didn't like the pen until fitting it with titanium meant I didn't want to have any regrets. I like stubs, but not for everyday use, so I resisted the chance to modify one of these. The titanium nib is not as soft as I'm lead to believe the Size 6 nibs are. It's soft, but I don't think it's quite as springy as the Visconti Dreamtouch Palladium nibs, for example. The Conid example I have is quite smooth, though I agree with previous reviewers that there's a slight feedback of titanium like a high frequency resonance....as someone who prefers little feedback, I find it quite pleasant and it's no where near Sailor levels. However...the gold. Wow. What a nib. It's smooth, it has some softness, and it's neither too wet nor too dry for me. It's unbelievably my favourite nib in my collection right now, and that's despite my conscious effort to avoid bias towards 'a very expensive recent purchase'. It's perfect for me, and I do actually quite like the gold tone against the titanium. I think it's a little bit of show, for an otherwise not-very-showy pen, and I prefer it to the rhodinated look. Simply put, I love the gold and a week into ownership, it's been on constantly. The $60 spent on the titanium is by now means a waste, and it's incredible that it can even compete with the stunning gold nib, but I can't see myself swapping nibs very much at all. I've gone through two fills of ink, and it just grows on me more and more. Conid nailed this one! This pen arrived in Australia at considerable cost. The Euro to AUD is not kind, and further import duty stung a little. It's my most expensive pen. Everything about this pen is exactly as I wanted it. 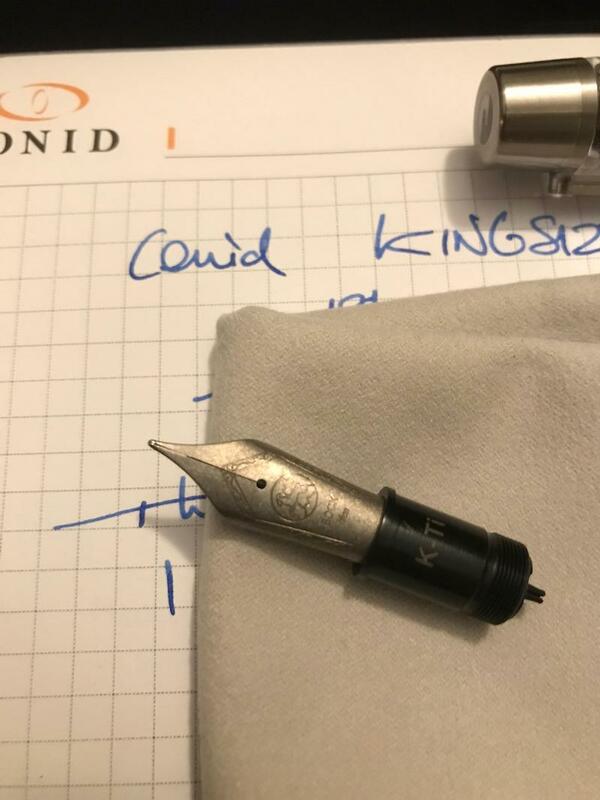 The experience purchasing from Conid was one of outstanding communication and as-promised service. This pen meets my needs as the ultimate daily user perfectly. It holds bucket loads of ink, looks pretty doing so, writes like a dream, and somehow flies under the radar without being excessively opulently flashy, with just a hint of bling with the gold poking out from the nib. It joins the final collection, complements it perfectly, and (hopefully) obviates any further pen purchases for the indefinite future. Overall, I love it! I highly recommend Conid pens to people with similar likes to me. Great review for a fantastic pen. 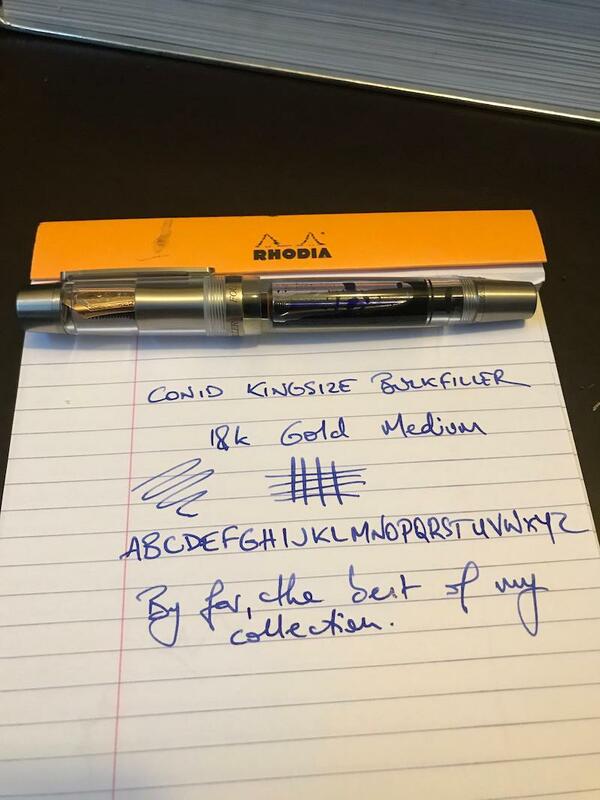 A Conid customer myself, I can confirm your feedback on the buying experience with them. From the look of your last picture you are obviously a man of taste! I enjoyed reading the review, thank you for taking the time to post it. I like that you've written the review with a fairly grounded perspective: you value the Conid for it's practical properties, rather than for the mystique of titanium or some other "romantic" elements. 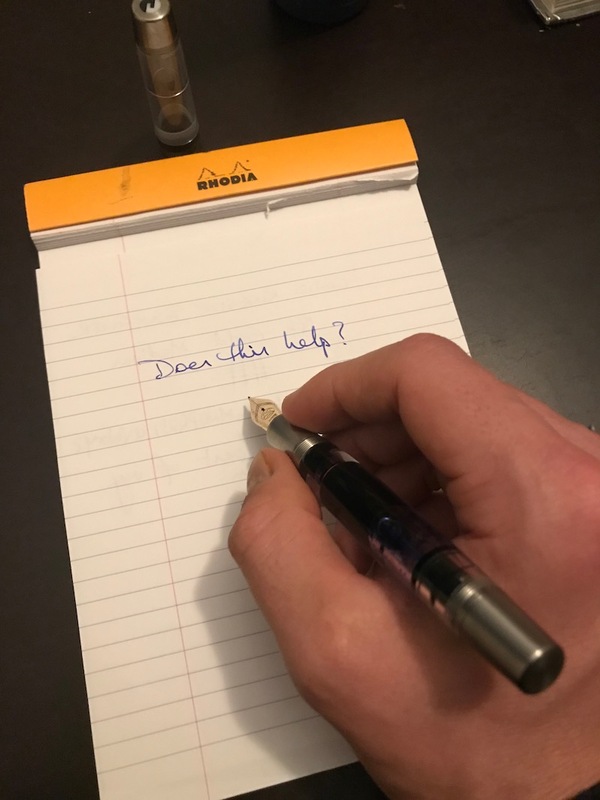 One thing I'm starting to value when looking at a pen online is photos of the pen actually being held in hand; for some reason I feel as if it gives me a better sense of the size of the pen (even though people have different hand sizes). That's something I would have liked to see here, as I'm curious as to how big the "Kingsize" is - the name makes me assume that it would be too big for my hand, but you seemed to think the size was perfect for you, so perhaps I'm overestimating it. I've shied away from photos with the pen in hand, since I figure everyone has both different hands, and also a different grip, making different sizes comfortable for them. The Conid is somewhat similar in girth and length to my Homo Sapiens, and I tend in general to like bigger pens. A great review, I have wondered about this pen for some time now, and you have answered all my questions. The way you describe the nib sounds exactly like the nib on my Delta Dolcevita Oro (also Bock made I believe), so if you like the nib maybe try a Delta if you decide to buy anymore pens. I'm not a demonstrator fan at all, but felt I had to read the Conid review, which was excellent. I enjoy when someone is really "taken on" by a pen, congratulations. Thanks for the photo, I think it does help. What is the pen pouch? Well done on this pen. Just forget the cost and enjoy. It's a very reliable pen that'll give you hours or relaxed writing. very nice review. I adore my bulkfiller. Congrats. Conid makes wonderful pens. 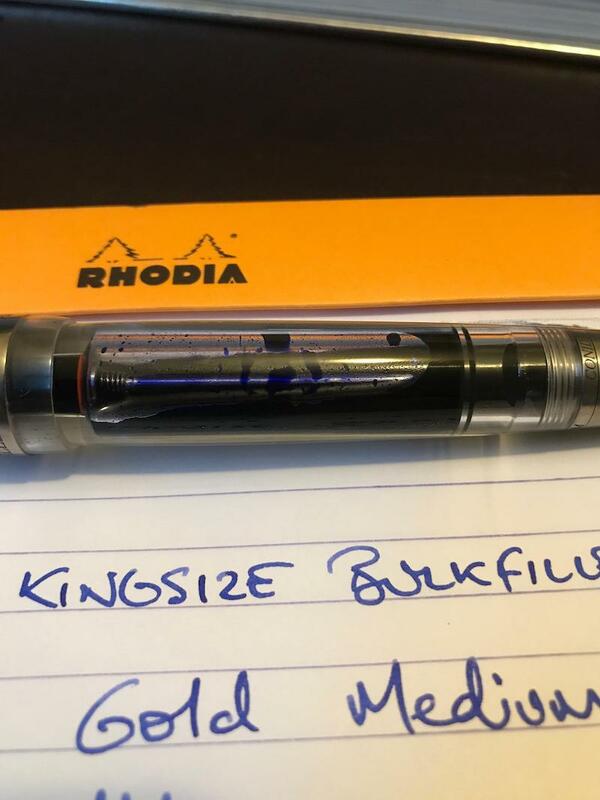 I have one bulkfiller, the Conid Monarch kingsize. It's an extremely well made pen and a very reliable writer. Almost ordered a demo but changed my mind, don't like them too much. Waiting for the next SE/LE. Edited by Mew, 12 October 2017 - 21:44. I am glad you love the pen, Conids are a thing of joy for me. They are purpose designed, precisely made and perfectly reliable. I have been using two of them (the Kingsize and an Ebonite Regular) for a while now and they never have flow issues, unlike some of my beloved Nakaya pens which can be finicky if not used almost everyday. Soon I will have 4 (one a regular demonstrator and the other a regular in the SE red from Antwerp). All wear, or will wear, Titanium Stub nibs (yes I am a bit boring). Enjoy your pen, they really can be the one pen. Due to preferring fat pens (MB149, Danitrio Takumi,...), I'm on the fence between the Minimalistica or the Kingsize. How did you chose which you wanted without handling them first? Obviously Francis knows these measurements better than I do but I'm surprised the Minimalistica has the same section girth as the kingsize. If you like fat pens, and not just wide sections you'll probably like the Kingsize more. If you're primarily concerned with the section width and don't have a strong preference about the other dimensions you may be better off with the minimalistica just from a cost perspective. The kingsize also uses a #8 nib compared to a #6 on the minimalistica if that matters to you. Either way you get a Conid so the pen will be terrific. Many thanks for the comment Ian. Prior to somehow landing on Conid as 'the' final pen, I wasn't much for demonstrators either. I hated the TWSBIs I had tried - finding them both ugly, cheap feeling, and not at all special with steel nibs. This is something else - I think it's the filling mechanism which gets out of the way and just lets the materials and ink show off. It's a 5-pen Pilot Pensemble. It's an outstanding product that suits my need perfectly. 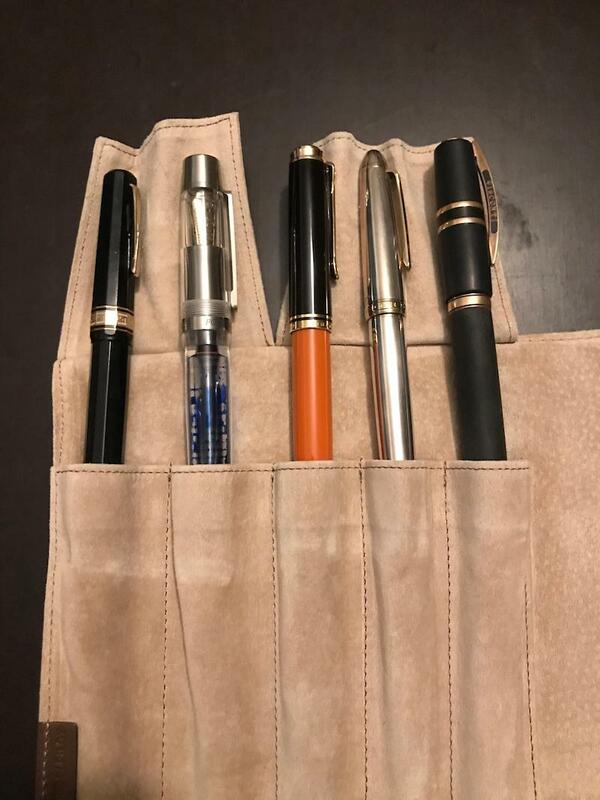 I have a Visconti 3-pen pouch for my EDC - filled usually with the Conid, a choice of one of the others, and a Visconti Ink Well for refills on the run. Thank you for the comment. It was your review that was one of the few that pushed me towards a purchase. I'm sorely tempted to try a titanium stub! In the end I took a leap, knowing that when size is a question, I've only ever got rid of pens for being too small rather than too large. I also felt that if I was going to spend the amount on the Minimalistica (which in AUD was already going to nudge AUD$800 with a couple of nibs) plus shipping, I would probably just regret not getting the 'flagship' for just a little bit more. Ok, a fair bit more. Great review; what a pleasure to read! I have a Kingsize demonstrator with a gold nib too, albeit the CAISO version. 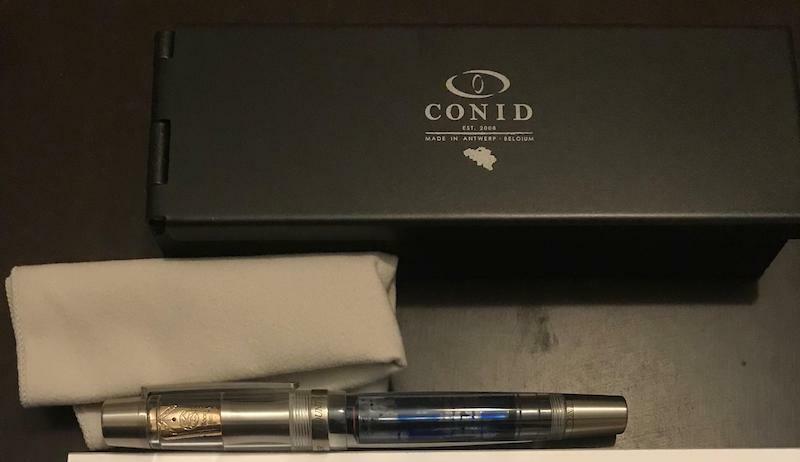 It is a stunning pen and "the additionals" such as the e-mail from Conid and the perfect communication add up on customer experience. Thanks, it does look very nice. Half_Inked_one You can buy additional nibs and tools from Conid. I have tools for a couple of mine so I don't need them for the Antwerppen, but I did order a Titanium nib (Broad stub) which will be shipped by the first of Novemeber. What you do is go to their web site pick the type of Pen ( King size, Regular, ect) select zero in the number of pens and enter the desired items under that (nibs, tools, customizations).